Moonlight Cycles believes that a bicycle should be fun to ride and deliver an experience second to none. Our target market is cyclists who value performance and durability at a competitive price point. We use lightweight chromoly steel that not only provides superior ride quality, but is made regionally. Our design process is based on data and testing, and promotes transparency with the customer. We are developing an enduro hardtail mountain bike that will be released for production in 2019. At Envizion3D, we provide our clients with 3D interactive virtual tours. This gives our clients a way for their prospective customers to interact virtually with facilities, real estate, and venues. These tours are often used as marketing content for whatever our client requires. 1 Million Cups is a free entrepreneurial program started by the Kauffman Foundation. Entrepreneurs around the country are invigorating their communities with new business ideas while enjoying a cup (or two) of coffee! 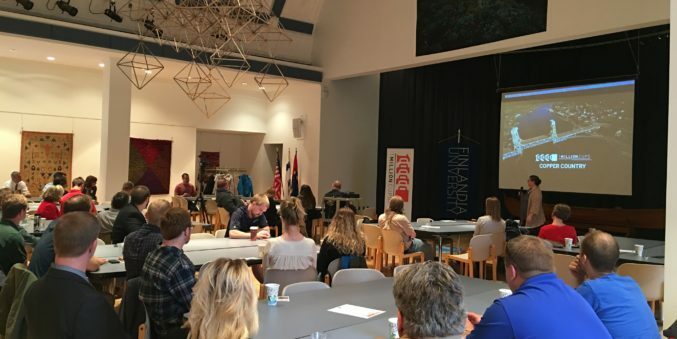 1 Million Cups is a fun way to stay connected to community, think about innovative ideas, and to find out about and support entrepreneurship in our area. Events are free and open to the public.